Last morning for Rob and his party was a cracker as they say somewhere. First tarpon to young Matthew what a fight a few jumps by the bridge then off into the Atlantic. Matthew told us all I think he is nearly done but the fish had other ideas. A long drawn out fight began and now with deeper water up to 30ft this fish was not giving in. At maybe just over 100lb these smaller fish can have a lot of fight and this one did. I touched the leader many times but on one last run under the boat the main touched the boat and game over. Back to the bridge and very soon tarpon on and back into the Atlantic. This was also a smaller fish but not as bad as the first one and we were able to land and measure it but my camera crew let me down. This fish was 111lb about the weight of the first nice to see a different year class. 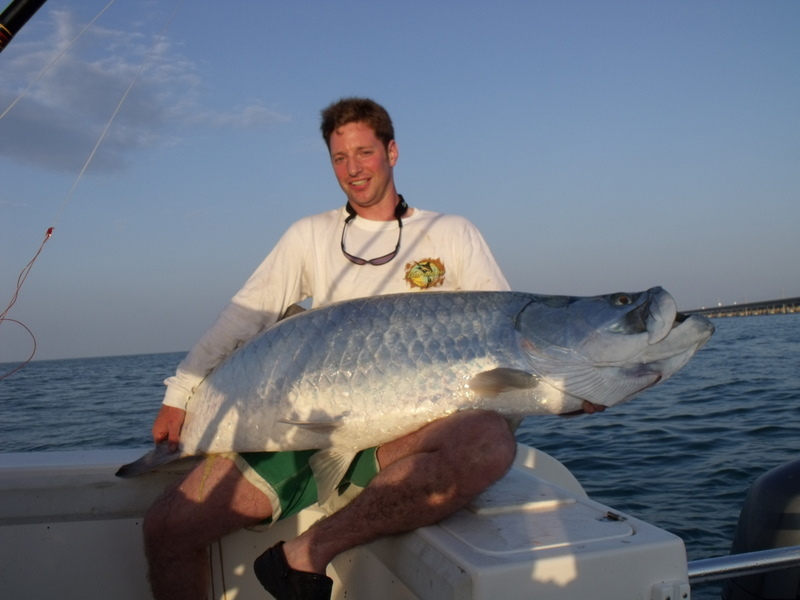 People ask how do we get the weight and it is down to the guys at the Bonefish and Tarpon trust. Thy run a very good website www.tarbone.org which has a tarpon weight calculator just put in the length and girth and they do the rest. This is not the normal formula but one worked out over many years just for tarpon with real fish so very accurate. What a fishing holiday Rob and his crew had this year they caught 41 species and if you add in the 6 I caught that makes a total 47 well done. Again this shows we can do it all from the dorado 20 miles off-sore to the reef wrecks and flats, the complete Florida Keys experience. 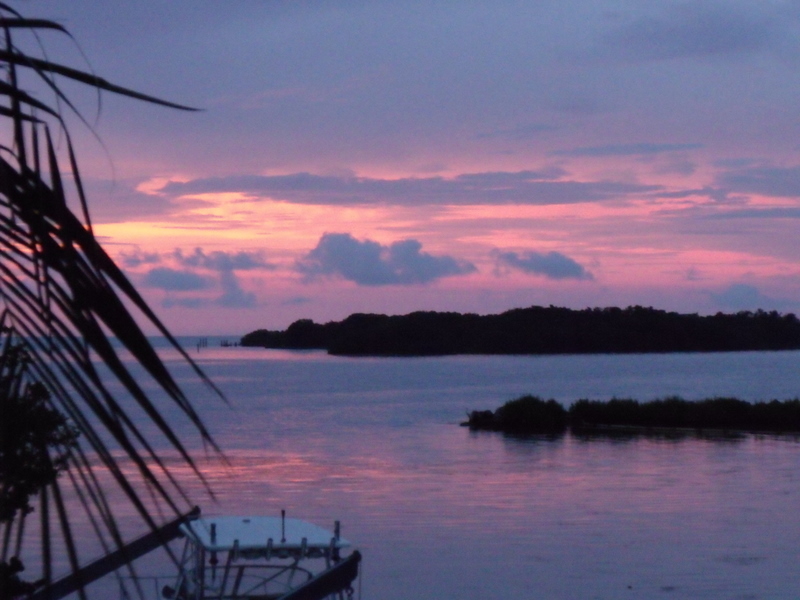 Photo this blog a famous Florida Keys sunset not from Key West but our fishing base looking into Florida Bay, and Matthew your big bull shark well may be next year. 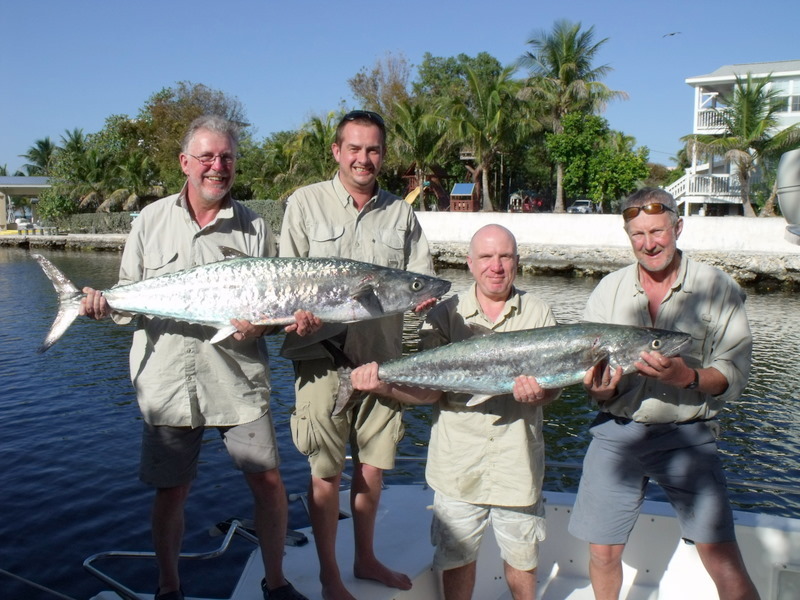 Rob and his king mackerel and Chis after losing a big tarpon in Gambia to get a 164lb one I think I made a few dreams com true. In my opinion if you lose the fun of catching small fish you have lost a part of the fun of fishing. A day on one of our Florida Bay wrecks showed what this was about. We had plenty of sporty shark snapper and grouper but it is great fun to put down a small bait and just see what is also down there. This normally the bait rod as blue runners are top kite bait and this day the kite was fish very well. Even tried to video a kite hit as the black tip were on fire but not quick enough always seemed to be rigging at the wrong moment. 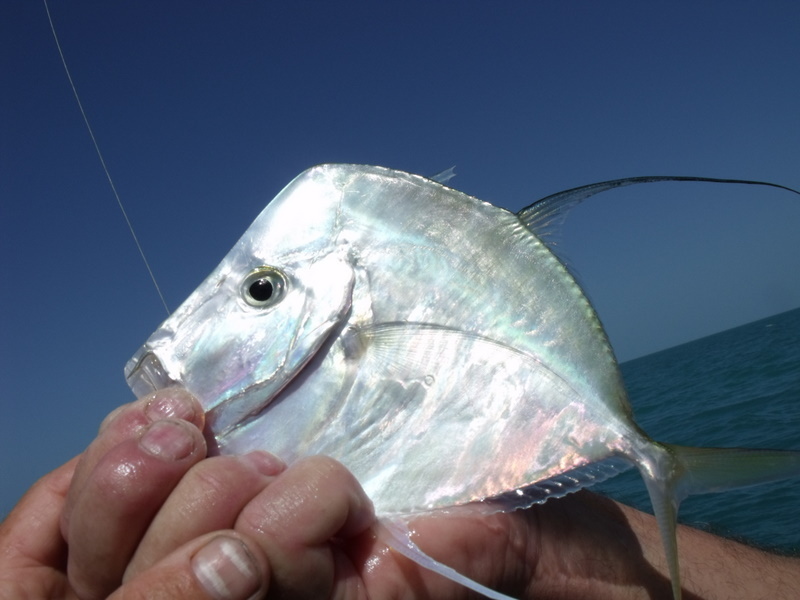 Chris had a hell of a fight on the bait rod and after some time up came a Florida Pompano. A scrapper on light tackle and as it says in my fish book under food value reputed to be the best and acording to Rob and the boys they are right. 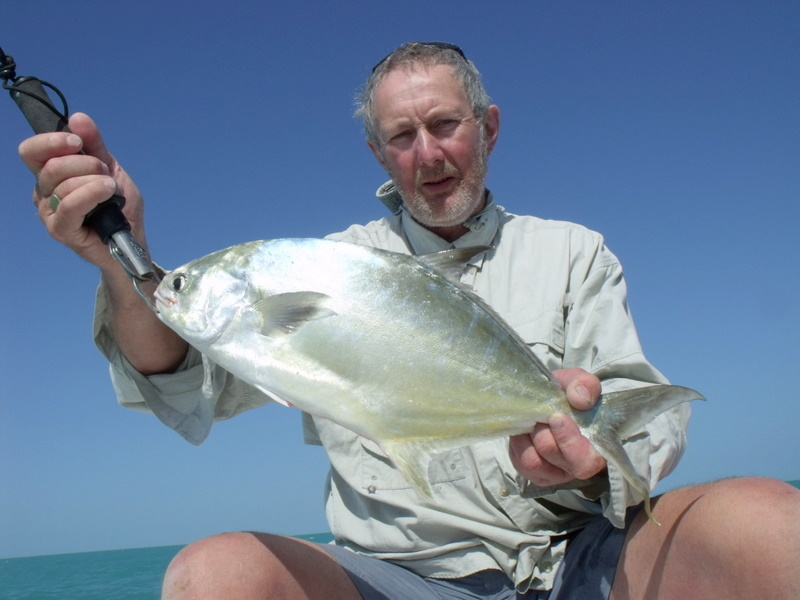 Next strange fish on the bait rod a Lookdown strange indeed. Very thin and looks like it has just come out of the chrome plate rs tank. One wonders why but the local answer is the more shine and reflection on the fish the harder the predators job is. It is also nice to take a bit of a time out a few small fish and get ready for the next big one. I normally say main tarpon season April, May and June but Rob and his party wanted to have a look so alarms set for 4.30 and off we went. Well we were the only boat on 7 mile bridge so maybe we were a few weeks out but you don’t know till you go so out go the crabs. Nothing straight away but we kept running the baits back then Chris said my floats moving sideways. Strike strike I shouted and tarpon on but one high jump and off don’t you just love to hate these oversize herring. Tide started to drop and it was getting light so we did a few drifts with the boat. 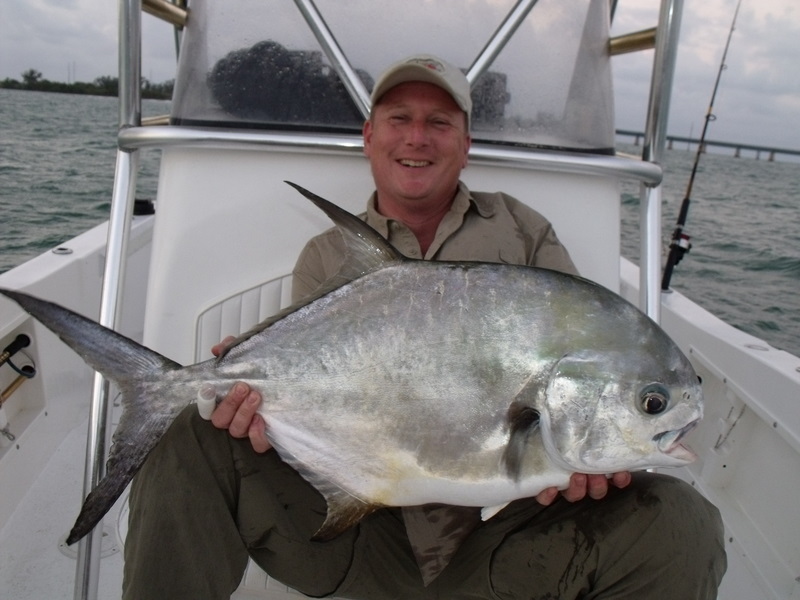 The tide changed so as it was light we went to a permit mark I have as these fish feed more in daylight than tarpon. Pick down and crabs out again running the baits down the side of the flat then from nowhere Chis was on again. This looked a looked a good fish then right out of the water a massive tarpon jumps no permit but this will do big time. Then throw the anchor and follow this was going to be a long one. Well it was 1hr 15mins but we won and fish to the boat a stunning fish and what a start to our tarpon season. This fish had a massive girth and after the calculations came in at 164lb first tarpon for Chis and on he will remember for a long time. Long day as we went out into the Atlantic for an afternoon session and had an other 25lb + king mackerel, sharks over 100lb, grouper and a nice mixed bag. Back to the house a bit early but we have had a 12 hr day and the alarms are sett for 4.30. Did I say these fish get under your skin. Its a funny old game someone once said this could not be truer about running fishing holidays. Rob Shipley and his crew are here on there annual trip to the Florida Keys. 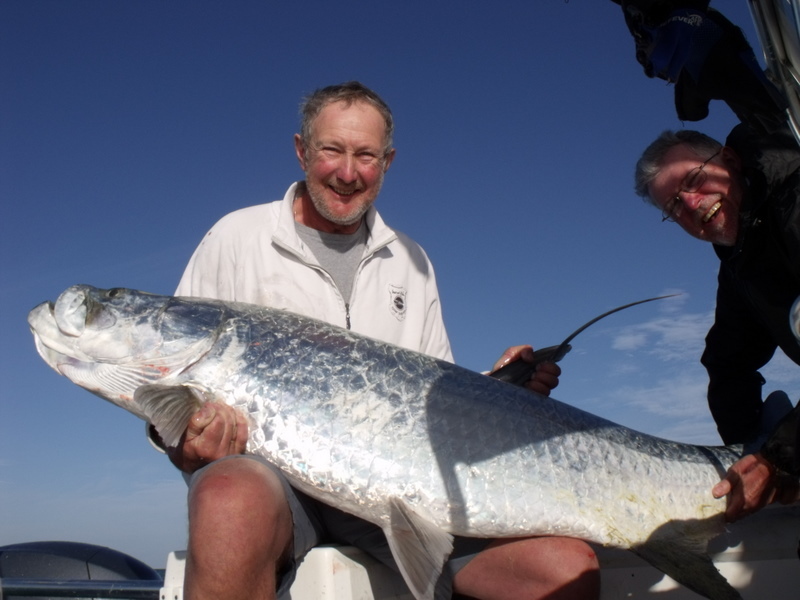 This year they have come a bit later to target our spring fish tarpon, dorado ect and maybe get some serious sun. Well weather fantastic high 70s and wall to wall sun and one fish ticked of box dorado in fact on the first day they had 17 species. 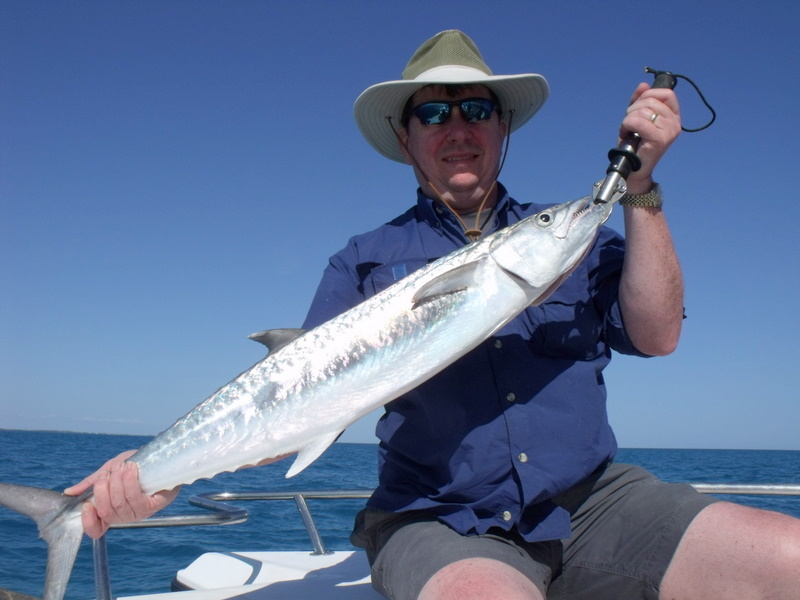 During our planning meeting [ breakfast Helens famous Florida Keys fry ] Rob said he fancied a go at some kings. 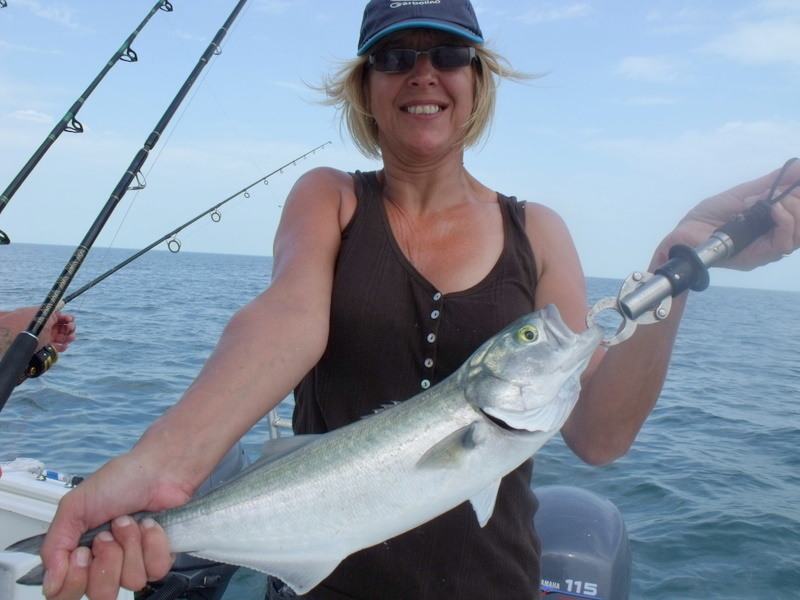 Well on our first day while catching bait mackerel and ladyfish the shark rod went off. I always have this out when we are getting bait the main reason if there are to many shark bait can be hard to get and we need to move, the other reason it would be rude not to. The fight was good but not sharky, then a bright flash of silver a big king. A nice fish a shade over 20lb a shame to be out gunned on a shark rod my first king on a shark rod in over 12 years fishing in the Florida Keys, but well done Nigel. Yesterday at the planning meeting a day in Florida Bay was the decision. Shark, wrecking and just all round rod bending was the order of the day. First stop bait, mackerel hard to get but a vast amount of ballyhoo a top king bait so load up the bait wells and of to the mad shark mark. On the way we go past a wreck so a change of plans and we do a bit of wrecking. Hard to get a good anchor set as wind over tide but we give it ago anyway. All baits down and Rob takes the king rod down goes a live ballyhoo on the famous stinger rig a proven killer. Then bang fish on as I have said before the take and first run like hooking a car on the motorway from the side. Well this puppy was going to make us work. First long run went round a pot marker and we all thought it was going to end in tears as Rob was about to be spooled. Mark anchor and follow big time well managed to get line off pot marker and Rob did a good job and after some time I lifted a 30lb king into the boat. For some reason Rob put the king rod down again and as the bait hit the water off we go again. An even bigger fish some people just like pain this one bottom out my 30lb bogas so 35lb was my estimate. Just like the buses wait for one then two come togther, nice touch from Rob on the way back he said that was the best days fishing in a long fishing career he has every had my job done. I have to completely agree with Henry Gilbey now is just not the time for a normal blog. Feelings and thoughts have to go out to all over there. The true scale of the event was brought home on US television the other night. A guy had gone to see how his family had survived and on arriving at there home nothing. Not only had there home gone the entire village had just gone. How does one cope with some like that the uncertainty must be overwhelming. This will go on for a long time and the situation with the power plants is far from over. The problem with radiation it is invisible and you don’t know till it is to late. Again my thoughts and feelings go out to all concerned. After one of our breakfast day planing meetings we ended up 11 miles back into Florida Bay one day last week. The number one plan was first catch enough mackerel for a days sharking then off to the mad shark mark going via a wreck. The bay mackerel mark is a large area of bay grass not the turtle grass you find on the flats where the bones and permit feed. This grass is much longer and more dense and is populated by lots of small fish and top Florida Keys bait the pinfish. This day as normal the bait fish including herring arrived as expectedbut a slack tide meant the mackerel were a bit slow. When they arrived Chis had one of the biggest spanish mackerel we have had this year at a touch over 6lb imagine a full set of mackerel feathers with these all on. Job done off to the mad shark mark via the wreck. On passing the wreck there was a boat on it and as these wrecks are small the local rule is first come first served so to the shark. Again the shark mark was a bit slow so I am wondering has this new mark lost its sparkle but as the tide was slow we decided to wait. True to form the shark showed up all sporty shark nothing over 50lb but on the light spinning rods fun many runs over 100 yds. Just a pain at the boat they just don’t know when to stop FUN FUN FUN. The record [ 31 ] was not broken we run out of time as a boat meeting decide we were going offshore the next day and need to get back to shop before they closed. Well that’s what they told me but after over 20 shark they all looked well knackered as well, my job done as well you don’t come on a Fish the Dream holiday not to catch fish. On a foot note it has become normal this year to play mind games with me. It involves catching my favorite food fish out of season and while we were catching bait Steven HAD to catch another big red grouper. I WILL BE BACK. Bill my dentist was over last week and despite coming over 4000 miles to the warm and the sun of the Florida Keys his fascination with teeth was still there. 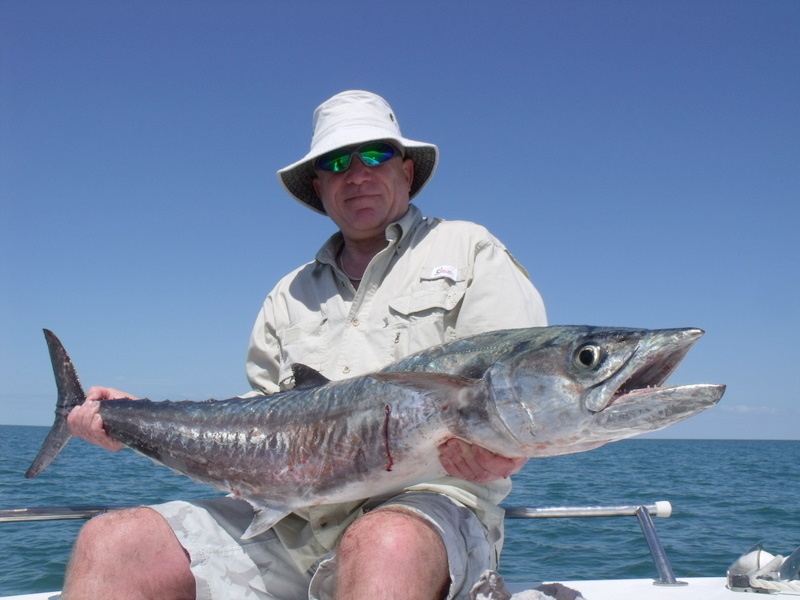 Some of the sharpest fish teeth in sea are the king mackerel ones. On the day in the gulf stream while unhooking the one I caught the slightest brush resulted in a deep cut. I did this to show everyone on board how not to do it and how sharp the teeth were. I don’t think. 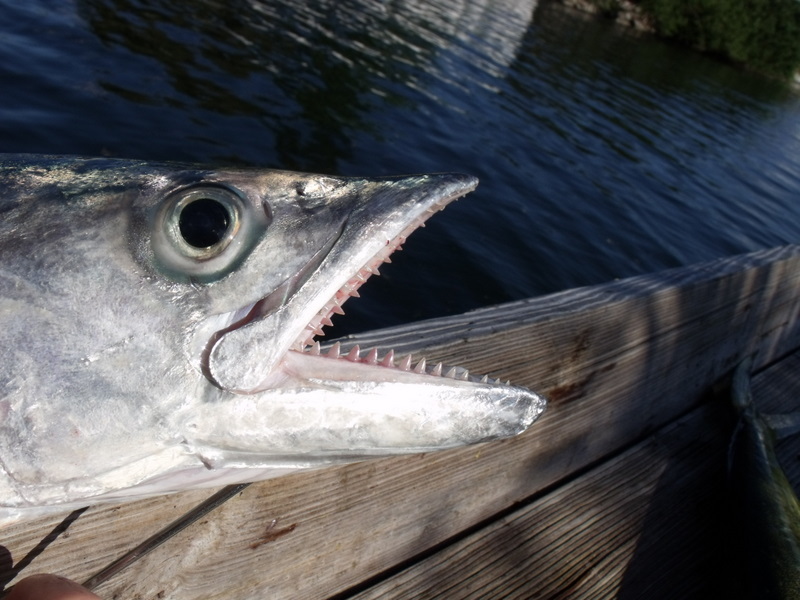 The teeth on king mackerel completely mesh when the jaws close. This is so the fish can do maximum damage on the first bite and come back to finish the job on the second strike. When fishing live baits we now tie a stinger hook [ small treble] on a short 5in piece of wire as well. Its probably 50 50 the fish caught on main hook or the stinger meaning we now catch 50% more king mackerel. After being bounced around on the gulf steam we came back to the sheltered waters on the reef and Bill want to catch a king as well so I sett him up. The kite is a good way but will no wind a shallow float will also do. With a live bait on the float was sent back in the tide a long way. The kings like to circle the boat then dart in ambush style. Bill sat with rod in hand, you can just leave the rod in a holder, the take is very brutal and its normally fish on. This was the case on this trip FISH ON despite Bills son trying to sabotage with his braid we got the fish to the boat job done again. The next day the fish went into our smoker and with a new very successful preparation was top tucker. My UK dentist Bill family and friends have been here all week lots to blog about. Yesterday we were going to the tuna grounds but bad weather 30 miles offshore meant a slight change of plans. So we decided to troll for dorado, this was on the tick box, and any thing else that came along. Less than 10 miles offshore the seas changed to very rough, but fish-able in our boat, weedy and a 3 degree rise in temp yes we were in the gulf stream. We even found a gulf stream monitoring device will try to find out more. There was to much weed to troll so we drifted with the stream. Birds and bait everywhere but I think the main problem was the depth of the stream we could see weed very deep and the fish I think were deep as well. So when its like this back to match the hatch with the catch. Free lining cut bait and plenty of loose feed was started, I chose to jig as with the coloured line you can quickly find the depth of the fish. Bang I was straight on too a fish a bit of a disappointment as it was a king mackerel and we were all hoping for tuna. Then I saw three big dorado follow a bait coming back to the boat but they would not take. 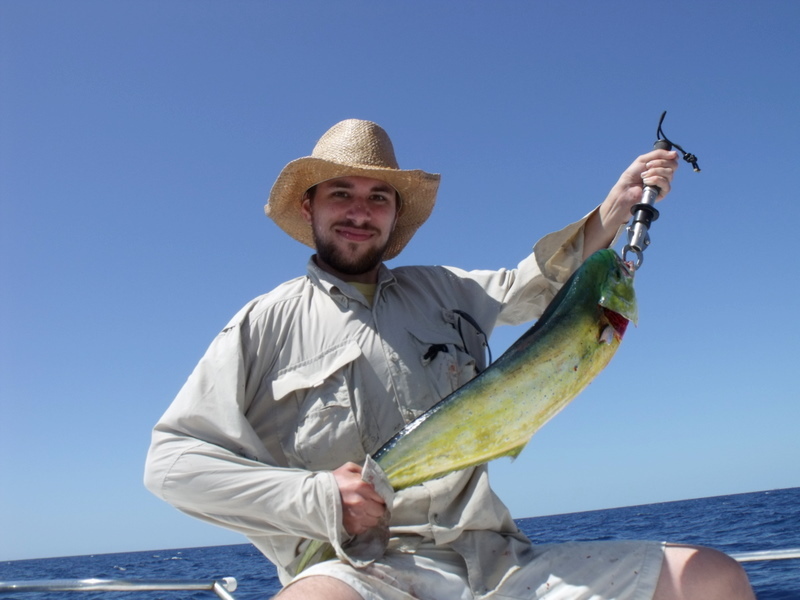 Shortly after Steve who was free lining had the first Dorado, box ticked. It was crazy fishy out there but I still think it was such a big area and very deep not like a normal weed line the fish were just scattered everywhere and not easy to find. Well we were lucky and Chris had the next one. At the start of there fishing holiday they had said they had both wanted to catch dordao and they both did job done. 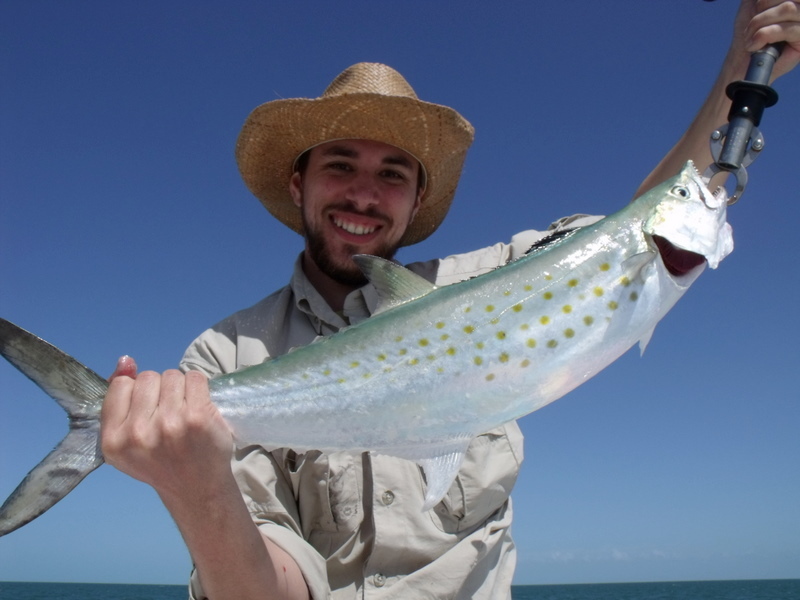 In all fairness I have caught many dorado over the years in the Florida Keys but the colours and fight still amaze me and your first expererince will live with you for a long time. This could be just the tonic for a single guy who has always dreamed of big tarpon and permit but has never be able to convince his friends. I know what seems a good idea down the pub or on a charter boat does seem harder to put pass her indoors or the boss. So when one of my friends had at short notice had to pull out of an exploring week the other two said why don’t we blog for a single guy to keep the costs down. The tarpon will be big and the big permit are on spawn and weather permitting a trip to my favorite sushi mark will be on as well. 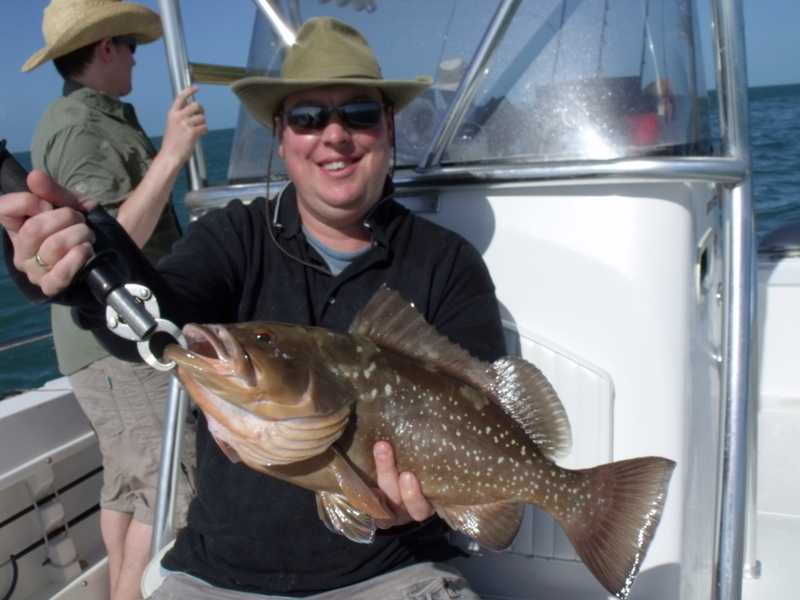 The week is 4th may to 11th this is a low key trip and even though we have been doing fishing holidays for 7 years its still nice to explore new marks. The fishing does change over here talking to a local guide who is finding permit where they haven’t been for 10 years. The local saying is you don’t know till you go, very true. The cost will be lower than our normal rate best to email me and I will make contact rdngd@aol.com. Pack some sun block and don’t just dream come and fish the dream. 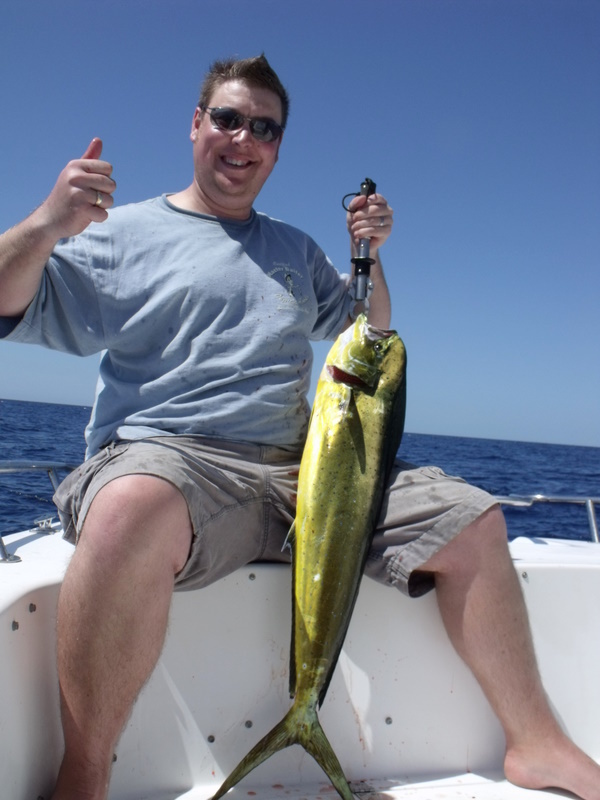 The one thing I like to do on our fishing holidays is for everyone to have fun. Yes big fish are cool and we do big, best well over 1000lbs and most days fish over 100lb are common but you can only catch whats there. I will always tell my guests enjoy or move. We are so lucky in the Florida Keys with so many different fishing grounds so close together a short move will bring different fish very quickly. One of the days with Paul and Carol is just what I am talking about. We went to a grass mark some 11 miles back in Florida bay and started chumming and with in minutes the pinfish arrived. 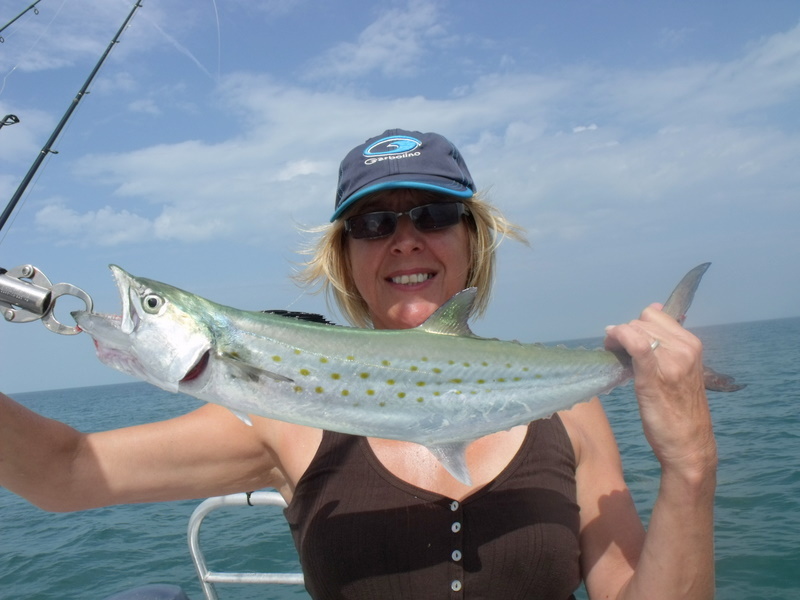 Then shortly after the Spanish mackerel and Blue fish came to feed on the pin fish. Now when this happens you have two choices enjoy as they say over here or move. Now as Carol had done beat up big we decide to stay and enjoy. To say these fish take freely is an understatement, they will nail anything and take the fly or lure right at the boat side FUN. An other upside is they both make top table fare and after bleeding and icing top tucker. While on days like this you cant imagine a shortage of fish both of these are cover by fishing regulations Blue fish 12in to fork and bag limit 10. Spanish mackerel 12in fork and bag limit15. Also spanish are top shark bait and we now use them in our frozen chuck blocks which work so well for the kings and tuna. An other interesting point on our fishing regulations that comes to a surprise to UK anglers is that all fish must remain intact at sea, with heads, fins and tails in place. These regs all work so well and change if there is a need before it is a problem hence our current grouper ban.